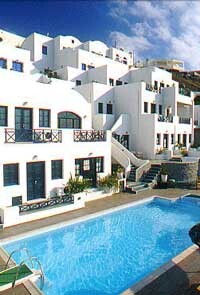 For more Aegean Thesaurus Travel accommodation options on Santorini click on the "Hotels" link above. Built amphitheatrically in Imerovigli, on the steep rocks overlooking the Aegean Sea, Andromeda Villas offers chance to escape from everyday life, to relax and concentrate, to enjoy the breathtaking view, calling to mind the geological and historical adventures of Santorini. Each of the studios and suites at Andromeda Villas is spacious with its own veranda from where you can view the volcano, the Caldera and Skaros. The 49 luxurious units each has the following facilities for a more enjoyable stay. Furnitured terrace or balcony, overlooking the caldera. Bathroom with bath-tub and hairdryer. Further facilities at Andromeda Villas include a pool with Jacuzzi, a pool bar with its own veranda where breakfast is served or a light meal if desired. A daily maid and laundry service is also provided.